When we hear the words of the Torah being read this Shabbat morning, we'll learn about a group of women who had a mutual goal and succeeded. A man named Tzelafchad died without having any sons and the laws of inheritance in the Torah only recognized male heirs, making no provision for a deceased father's land to be claimed by his female descendants. However, Tzelafchad's daughters, Machlah, Noah, Chaglah, Milkah and Tirtzah, refused to reconcile themselves to this fact and petitioned Moses to grant them their father's estate. Moses brought their claim to God, who responded: "The daughters of Tzelafchad speak right: thou shalt surely give them a possession of an inheritance among their father's brethren; and thou shalt cause the inheritance of their father to pass unto them. And thou shalt speak unto the children of Israel, saying: If a man die, and have no son, then ye shall cause his inheritance to pass unto his daughter." These five women didn't let the fact that they were women get in the way of changing history. And neither did the women who broke the gender barrier in the rabbinate. Prior to June 3, 1972, no woman had ever been ordained as a rabbi in the United States. On that date, Sally Priesand became the first woman rabbi in North America. The first Conservative rabbi wouldn't be ordained for another eleven years when Rabbi Amy Eilberg graduated from the Jewish Theological Seminary. It is appropriate that we learn about the courageous daughters of Tzelafchad this week following an op-ed in the Forward written by a female rabbinical student from the Jewish Theological Seminary who argues that motherhood and the rabbinate don't mix well. Chasya-Uriel Steinbauer, the mother of an infant daughter, is on leave from the Seminary while she stays at home to care for her daughter. Somehow she found the time (probably while her baby was napping) to post on the Forward's Sisterhood blog that mothers who are practicing rabbis are just another example of the "Super Mom-syndrome now cloaked as the Super Ima-Rabbi syndrome." Well, I couldn't disagree more. Maybe Chasya-Uriel Steinbauer is not able to balance motherhood with the life of a rabbinical student, but I have certainly witnessed many women who were able to strike this balance -- and impressively so. I remember my first day of rabbinical school orientation like it was yesterday. We sat around a conference room table introducing ourselves. Many of us were right out of college. Some were single, while others were either engaged or newly married. But there were also several older students in my rabbinical school class. I remember Paula Mack Drill introducing herself in her warm way by telling us that first and foremost she is the mother of four children ages nine to two-years-old. And she wasn't the only woman in our class who would spend the next six years raising a family and fulfilling the necessary credits to graduate and become a rabbi. During rabbinical school, many of my female classmates became mothers for the first time (or for the second or third time). And many of the men (myself included) became fathers for the first time. Was it challenging to be both a mommy (or daddy) and still manage to attend classes, study in the beit midrash, take exams and manage a part-time job? Of course it was. Just like it is a challenge to balance motherhood with medical school or law school or any other graduate school. But it can be done and it can be done without forsaking the children. The experience of coupling motherhood with a career is something women fought for in the last century. The opening of the doors to women in the rabbinate was very much a result of the Women's Liberation Movement. And Judaism is the better for it. 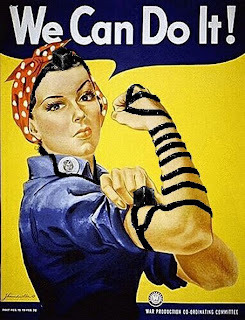 This past Mother's Day I wrote an article for JTA in praise of women rabbis. I wrote this because my rabbinate and my Jewish experience have only been enhanced by the presence of women rabbis. From among my rabbinical school class alone, I've seen one of my female classmates go on to become an entrepreneur, founding a new congregation and being recognized as one of Newsweek Magazine's top congregational rabbis. I saw another female classmate go on to become one of the highest ranking chaplains in the Navy. I saw other female classmates build small synagogues into larger, thriving communities. And these are only the women with whom I was ordained. Look around the Jewish world and you'll see hundreds of women successfully raising their children while also educating, counseling, writing, leading organizations and preaching. Chasya-Uriel Steinbauer urges, "I want us to question why we allow our lives to be set up in such ways where we feel that they have no choice but to work or attend school and thus leave our babies in the care of others." You definitely have a choice. But many women in the 21st century are choosing to do the motherhood thing along with being an executive or a graduate student or a rabbi. It can be done and it can be done gracefully without any risk to the children. I'm actually glad that Steinbauer wrote this because it gives us a chance to praise the women who balance motherhood with their careers. No one says these women have to do it alone. Help comes from devoted spouses, caring parents serving as loving grandparents, and talented nannies. Back in rabbinical school, there were many days when a baby would join us in class. Sometimes it was a mommy who brought the baby and sometimes it was a daddy. Not only did we not mind having a baby or two in class, we actually liked it. It was a testament that we didn't have to check our parenthood responsibilities at the door of the Seminary. It is really no different than a rabbi who sits on the bimah (pulpit) with her baby. It is a scene that might have been odd a few decades ago, but today it is commonplace. I am both a mother and a rabbi. Some days I'm more ima. Some days I'm more bima. (See blog title.) Some days, I'm trying to make it all work. But I don't think I'm doing it wrong. I just know that I'm doing it. I've created four wonderful little people and my husband and I delight in their growth of body and spirit. We definitely juggle, we definitely argue over who goes where and when. I hope Chasya-Uriel Steinbauer returns to rabbinical school soon. I'm sure she'll become a talented rabbi while being a nurturing and devoted mother too. These are not mutually exclusive roles in life. It might just take her a few years to figure that out. Although the courageous daughers of Zelophead succeeded in changing the law of inheritance to make it for daughters also to inherit the property of their father with the absence of a son, as we will see in the parasha of Masey there is a caveat. They have to marry within the tribe, and so they did, they all married their cousins. Rabbi Jason - Why did it take Conservative Judaism until 1985CE to recognize the right of women to be rabbis? Normative Judaism has never recognized women Rabbis from at least 200BCE until 1985 CE. Why the sudden change? If such is halachically acceptable why was it never done? I'm not a rabbi (but I'm married to a Hazzan! ), but I sooo appreciate your post. As a future PhD student and someday parent, so glad to read posts like this. Todah Rabah, Rabbi!